Long, long ago, much of the London area was covered in forest. The Romans cleared some of it away, but large swathes remained through Anglo-Saxon and early Norman times. The largest trees and groves remain landmarks to the current day, and there are now approximately as many trees in Greater London as there are Londoners (7 million). No wonder, then, that many London place names have arboreal origins. Here are a few named after individual or small groups of trees. Becontree: This sprawling area in Barking and Dagenham is recorded in the Domesday book as Beuentreu, meaning tree of a man called Beohha. 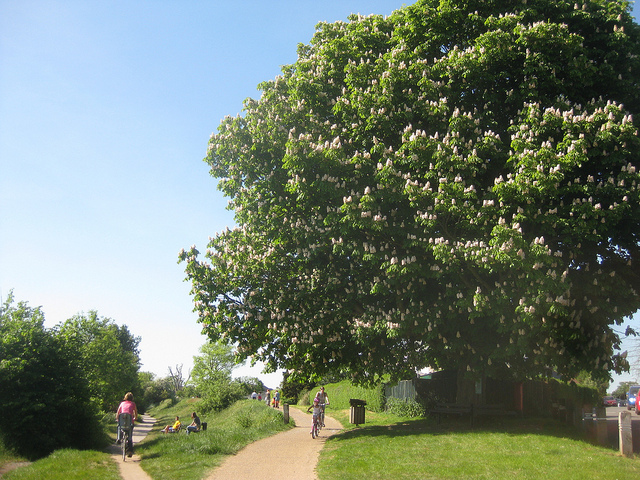 The tree served as the meeting point for the Becontree Hundred, an ancient administrative body. Burnt Oak: This north-east suburb is a relative newcomer, first mentioned in 1754. It originally referred to a very small area, perhaps a single field, containing a charred oak tree, and was known as Burnt Oak Field until development accelerated in the early 20th Century. Gospel Oak: You can probably guess where this name comes from...a prominent oak near Hampstead Heath, where people once came to hear the word of god. According to some sources, the tree marked the boundary between the parishes of Hampstead and St Pancras on what is now Southampton Road. The area was developed from the 1850s, eradicating the tree in the process. Honor Oak: This south-eastern area takes its name from an oak on top of a hill (often called One Tree Hill), supposedly used as a picnic spot by Elizabeth I in 1602. The current oak at the summit is a replacement, planted in 1902. Another One Tree Hill rises at the eastern end of Greenwich Park. Nine Elms: There's not much in the way of greenery in Nine Elms these days (unless you count the produce on sale at the market), but once upon a time this riverside area near Vauxhall was verdant and swampy. The nonet of elms were first referred to in 1645, but their fate is unknown. The area should see significant greenery return, as Nine Elms undergoes major redevelopment — perhaps a chance to restore those elms? Seven Sisters: This name, stemming from Greek myth, crops up all over the world, and indeed on other worlds and star systems. London's Seven Sisters is named after a circle of seven elms surrounding a walnut tree, present from at least 1619, though the modern name is not recorded until 1732. New trees were planted in 1876. The current circle comprises hornbeams, which were planted by five families of seven sisters in 1997. Many other areas include references to groups of trees, including (among dozens) Arnos Grove, Oakwood, Colliers Wood, Forest Hill, Forest Gate, Wood Green and St John's Wood. In addition, any area ending in 'ley', such as Wembley, Finchley or Bromley, signifies a clearing or meadow in woodlands.